While we trace inventions that changed the world printing is considered as a turning point. Invention of fire was one; mariner’s compass was another. Printing was momentous in its capacity to work out a sea change in transmitting thoughts of man,which however came at the cost of another. Mechanical types killed calligraphy. Gutenberg changed the labor intensive process of disseminating ideas of man. Earlier times the monks laboriously copied books. Owning a book was a luxury that only a few could afford. Fine calligraphy of the text on vellum and when illuminated made the text come alive; on the margin one may guess how the scribes alleviated the drudgery of copying, with fanciful creatures. These like cathedrals typified man’s offering to God the work of their hands that took their whole lives as well. There was art, faith and a singular dedication to glorify their maker. Printing on the other hand made reading easily accessible to the masses. Penny dreadfuls and yellow journalism were waiting to be discovered. Johannes Gutenberg invented the printing press with replaceable/moveable wooden or metal letters in 1436 (completed by 1440). This method of printing can be credited not only for a revolution in the production of books, but also for fostering rapid development in the sciences, arts and religion through the transmission of texts. The earliest dated printed book known is the “Diamond Sutra”, printed in China in 868 CE. However, it is suspected that book printing may have occurred long before this date. In 1041, movable clay type was first invented in China. Johannes Gutenberg, a goldsmith and businessman from the mining town of Mainz in southern Germany, borrowed money to invent a technology that changed the world of printing. The Gutenberg press with its wooden and later metal movable type printing brought down the price of printed materials and made such materials available for the masses. It remained the standard until the 20th century. The Gutenberg printing press developed from the technology of the screw-type wine presses of the Rhine Valley. It was there in 1440 that Johannes Gutenberg created his printing press, a hand press, in which ink was rolled over the raised surfaces of moveable hand-set block letters held within a wooden form and the form was then pressed against a sheet of paper. Johannes Gutenberg is also accredited with printing the world’s first book using movable type, the 42-line (the number of lines per page) Gutenberg Bible. During the centuries, many newer printing technologies were developed based on Gutenberg’s printing machine e.g. offset printing. 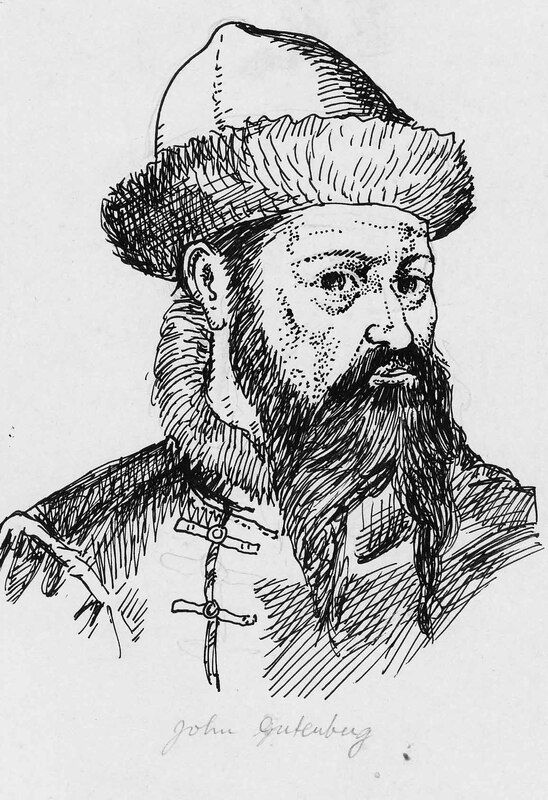 Gutenberg was born between 1394 and 1400 and died in 1468. In my post on Theory of Something I used the analogy of a walk in the woods to develop a scientific temper. Nature gave man the first stirrings to wonder at the simple daily occurrences. Thus one may wonder why leaves fall or an apple falls to ground and not fly off. If his train of thoughts carried him to come to grips with the gravity, naturally he may soon wonder why the moon does not fall as leaves or fruits? Man is in context of other humans who all have sometime or other similarly wondered as Isaac Newton Galileo or Kepler. How come then all are not scientists? The same pure impulses that instilled in a baby to wonder at everything have changed shape or run into other experiences that carry him to follow in many other directions. The pure impulse of truth must negotiate with life of each. The baby that wondered at the falling leaves has found what makes the world at large go gaga. Wealth. If he sells himself to cut down rain forests for profit he is only falling in with rest of the world that has made wealth their goal above everything else. No man even with a proper scientific spirit has stuck to a groove to investigate the alpha and omega of his universe. In 1869 Miescher discovered nuclein (DNA) and left since he could not precisely identify its use. Some 25 years later he could separate it into nuclide acid, a protein. It had to wait till 1920 to realize this nucleic acid plays a vital role in the chromosomes. In 1944 Oswald Avery identifies it as the active principle in bacterial transformation. In 1953 Watson and Crick could determine the double helix shape of DNA. In short the path cut in the woods is not one single highway but meandering pathways of so many acting out their hunches based on the single stirring of truth in each. Miescher wondering over the DNA in the cells of a pus he was working with, had no idea but got around to investigating it further after so many years. By then his active life must have passed and it was left to others to come back to it at their own convenience and needs. Meisher was vindicated in another age and on account of many other breakthroughs elsewhere. Child is the father of Man and unfortunately in many cases the truth has been clouded over by ‘ways of the world’ and how he looks at the world is not one to one but accumulated peer pressure of so many and immediate needs. Moral sense of an individual is unfortunately clouded over by many others. If he has gone under and did not do as he ought to have we may say it is human failing. There is no one who is perfect and if one say he is, he is a rascal of the first order. We can only behave as human hoping for the best and if we have found our feet we ought to think of failings of others in similar light. As a Christian I am in need of grace and it is what I owe to truth when given a Being and a name God. For each of us web of knowledge must be held in tact upon truth. For the world’s more full of weeping than you can ever understand. The poem was first published in the Irish Monthly in December 1886. The poem was then published in a compilation of work by several Irish poets Poems and Ballads of Young Ireland in 1888 with several critics praising the poem. Among the floating clouds a Giant lived a life of ease and untouched by age or want. Though the many islands surrounding his domain melted regularly to form rain pelting the earth below he suffered no injury. He for all his largeness didn’t let any fleeting thought escape. Once he thought a profound thought ‘if I were large there must be those forms larger than me. Next he thought there must be on the reverse scale miniscule atoms as well. Buoyed up by his new run of thoughts he said,’I would like to meet one.’ It was not out of vanity but to exchange some ideas he had lately dwelt upon. Indeed eons later he came across one which said he was proceeding to look for the largest form he could possibly find. ‘ Do you have a form, if you please?’ the Atom asked. ‘Can you not see my form?’ the Giant was amazed. ‘I am Truth.Wasn’t it obvious?’ The Giant shook his head. Searching for truth is for many is a useful tool to distract themselves from knowing what they really ought to do something about. This we have so many religions ,and folderol, believers, that render them unable to profit from truth which is in the very warp and woof of their existence. Man who tries to bend another to his ‘belief’ insults truth that is in all. According to Spinoza God is the Essence or causa sui and Nature are events in mode revealing truth about that Cause in many telling ways. Man who is sensitive to his place in the scheme of things shall lay emphases differently than where religion does. Religion is more concerned about its organizational health than moral health of the flock .Result of this is evident in our present times.